Departement of Vaucluse - Pop. 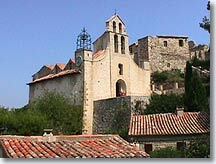 : 700 h.
18 km south of Vaison la Romaine via the D977 and the D88. 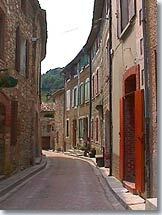 Gigondas, this little village with its great name is situated in Upper Vaucluse at the foot of the Dentelles de Montmirail. This little village with only 700 inhabitants is an absolutely essential stop for lovers of this world renowned vintage. In Roman times the village was called "Jocunditas" which means joy or rejoicing... its famous vintage was already appreciated in those days. The region turned to single crop farming - wine-growing - following the great frosts of 1929 and 1956 which destroyed the ancient olive trees. The Gigondas "appellation d'origine" was requested as early as 1924, but was not granted until 1971. Vineyards here cover an area of 12 km² and more than five million bottles are put on the market each year. These wines are powerful and generous, robust and well-balanced. Arriving in Gigondas via the secondary road that runs through the lower part of the village you will come across a succession of cafés and cellars leading up to the Place Gabriel Andéol where the mairie and the winegrowers cooperative are located. Leave your car here and take the time to discover this village that is continuously being restored, developed and enhanced. Walk up through the pretty streets and alleyways lined with stonework houses to reach Ste Catherine's parish church with its beautiful 14th century facade. 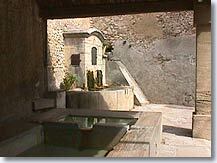 On the way you will be able to admire the fine view that you have of the region and which extends right to the Cevennes. Next to the church you will be able to visit the Hospices, via a stairway-like trail lined with 21 monumental sculptures, the work of contemporary artists. These buildings were erected by a religious brotherhood in 1678 to care for poor people and children. Following the revolution, in 1800, they became a Hospice. They were then left unused for the next 2 centuries. It was not until 1982 that these ruins started to come to life again and little by little the Hospice was restored thanks to the association "Gigondas d’hier et d’aujourd’hui", the mayor, the local winegrowers and numerous voluntary efforts. Today on the ground floor you will find wine cellars offering wine tasting installed by the winegrowers' association, and upstairs a contemporary art exhibition. Church of Ste Catherine (11th century). Romanesque chapel of St Côme & St Damien. 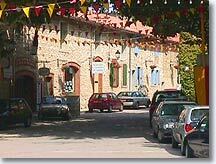 The village, the winegrowers' cellar. The Hospice and its 21 monumental sculptures. 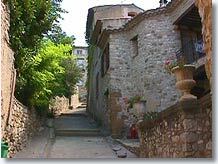 Sablet (3,5 km), Violès (5 km), Vacqueyras (3 km), Beaumes in Venise (8km).